At NZB Family Law, we have the expertise to provide pragmatic solutions to all your family law needs. Our team is experienced in handling complex dissolution-related financial matters, property, custody matters, international dissolutions and child abductions, and child protection matters. We take pride in supporting our clients through life’s rockiest of times with wisdom, creativity, vigor, and compassion. We welcome the opportunity to guide you through your journey. NZB Family Law is a Minneapolis based family law firm that casts a wide net of representation, assisting clients locally in the metro area, greater Minnesota, as well as internationally. Team NZB has built unparalleled expertise in handling complex family issues ranging from dissolution matters with significant domestic abuse issues to international dissolutions and child abduction issues. 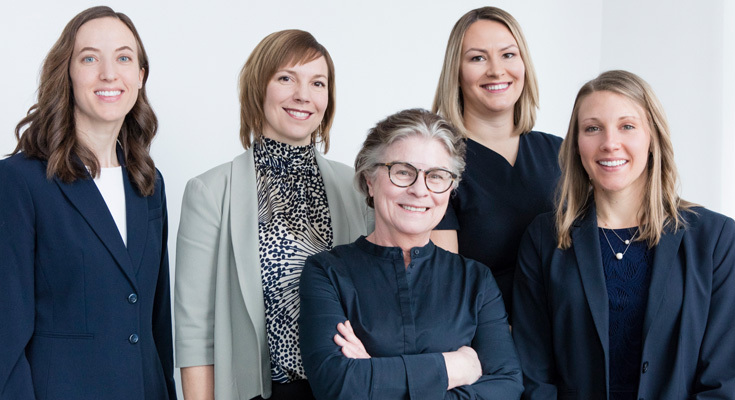 Our team of attorneys: Nancy, Jessica, Ruta, Katie and Ann, paralegals: Monica and Jen, as well as legal assistant, Kate will work tirelessly to offer each and every client prompt and focused service, realistic solutions, and guidance. Team NZB is poised to represent you whether inside a courtroom or in all aspects of alternative dispute resolution. Our team takes a solution-focused approach to all your legal needs. Our expertise in a wide variety of areas allows us to quickly identify legal issues and offer creative and realistic solutions. Your well-being is our success.